Blood and his cronies attemp to steal the Crown Jewels in 1671. Rumor has it that King Charles II hired Colonel Thomas Blood to swipe St. Edward's Crown, the Sceptre, and the Orb from Martin Tower in 1671. Having fallen on hard times, King Charles II indeed conceived of a way to augment the royal coffers, to open the Jewel House to public viewing for a small price. I don't think he actually hired the thief, even though he did pardon the criminal. It appears that King Charles II was motivated more by amusement (or possibly threat of a different sort) than by perdition when he pardoned Colonel Blood of his crimes. It appears that Colonel Blood carefully planned and executed his failed attempt to steal the jewels with the help of a woman and three of his friends, Robert Parrot, Tom Hunt, and Richard Hallowell (Holloway). In early April of 1671, Talbot Edwards and his wife invited a man calling himself Parson Blood and his ailing wife into their home in the Tower of London. As the Deputy Keeper's wife and daughter ministered to the parson's wife, the parson appraised his surroundings, taking note of anything that could be to his advantage in swiping the jewels. After several return visits in disguise as the gentle parson, Blood gained Edwards' confidence to the point that he agreed to a betrothal meeting for his daughter with Blood's "nephew." For this most auspicious meeting, Blood invited his associates and Edwards invited his son. Waiting in the sitting room, Blood suggested that while they awaited the arrival of the women, he and his friends might like a tour of the Jewel House. Eager to please, the 77-year-old Deputy Keeper obliged, only to wind up hooded, gagged, and bound on the floor. While Hunt and Parrot beat the clamoring Edwards, Blood flattened the Crown and stuffed it in his cassock and then dropped the Orb down his breeches. 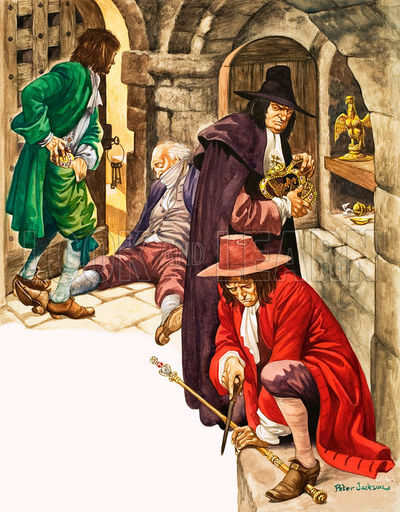 Edwards, now incapacitated on the floor, was unable to stop the other two men from their attempt to saw the Sceptre in two for easy concealment. At the sound of Edwards' son coming to the rescue, the two dropped the Sceptre to the floor, and the men fled the scene. Blood took a shot at the yeomen at the Byward Tower, who dropped to the ground as if hit and allowed them to escape. They ran along the river, where Sentries alerted passersby near enough to take them down. Upon capture, Blood refused to speak to anyone but King Charles II, who he knew to be a man of great curiosity who appreciated intrigue. After a man-to-man chat, King Charles II surprised everyone by granting a pardon to Blood on all counts of treason, murder, and felonious acts. St. Edward's Crown, which had lost a pearl, a large diamond, and several smaller diamonds, was repaired and restored to the Tower, as were the Orb and the Scepter. Talbot Edwards remained in service to the King as Deputy Keeper for another three years, though he was not well rewarded for his courageous efforts to stop Blood. He died three years later at age 80, possibly from ill care of the wounds sustained during the theft. 1. Castles. "Crown Jewels." Accessed June 22, 2012. http://www.castles.me.uk/crown-jewels.htm. 2. Castles. "Martin Tower." Accessed June 22, 2012. http://www.castles.me.uk/martin-tower.htm. 3. De Ros, William Lennox. Digital edition of Memorials of the Tower of London. London: John Murray, 1866. 4. Photographers Resource. "Tower of London." Accessed June 22, 2012. http://www.photographers-resource.co.uk/a_heritage/Castles/LG/England/Tower_of_London.htm. 5. Smith, George. Edited by Leslie Stephen & Sidney Lee. The Dictionary of National Biography, Volume 2. New York: The MacMillan Company, 1908. 6. Dave. "How to Steal Scepter and Orb: Thank Offerings to the Curious." Madame Pickwick Art Blog. Posted September 7, 2010. Accessed June 22, 2012. http://madamepickwickartblog.com/2010/09/how-to-steal-scepter-orb-thank-offerings-of-the-curious/.